On the wetter side of the Big Island, coffee has reclaimed land from sugar. A sip at Hilo Coffee Mill. Coffee Mill is in the Big Island’s renewed growing region. Kristy Hill releases a roast. Some of the world's most famous coffee is grown along the Kona Coast, on the leeward side of the Big Island, where plantations big and small nurture their well-deserved reputations. Now, though, a band of small growers on the opposite side of the island, a 2 1/2 hour drive, is seeking its day in the sun — at least figuratively. The coffee "can technically be called 'shade grown' because a sunny day is kind of rare," Jeanette Baysa said of the crop she farms in Mountain View, about 15 miles south of Hilo along the Volcano Highway. Cloud cover is common on this verdant side of the Big Island. 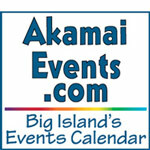 Tradewinds bring as much as 140 inches of rainfall a year, five to seven times as much as the coastal region surrounding the more touristy Kailua Kona receives. "[Our] beans are bigger because there's a lot more moisture here," Baysa said. The coffee "is less acidic also because of the rainfall." Coffee plantations aren't new to this wetter and less-trafficked part of Hawaii. Whether in the café, the roasting room or on the lanai, visitors to her Hilo Coffee Mill are as likely to savor tradition as a cup of joe. When coffee was first introduced to the Big Island in the 1800s, thousands of acres were planted, much of it on the windward — or Hilo — side. "It went away because of sugar [cane]," Baysa said. "Coffee was too labor-intensive." Over time, the days of cheap Hawaiian sugar disappeared, and coffee growers began to reclaim the fallow land. When Baysa bought her plantation in 2003, she brought in two bulldozers to rid the land of cane. "It took six months to get down to dirt," she said. 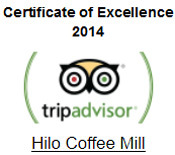 Since harvesting the first crop of beans in 2007, the Hilo Coffee Mill's roasts have been consistent award winners. They're little known outside the region, but their reputation is growing. "It has a really nice, rich, bold flavor; it's finished really smooth," said Kelly Martin-Young, the dining room manager at Hilo Bay Café. The upscale Hilo restaurant has been using Baysa's coffee exclusively for about a year, largely because of its freshness. Martin-Young places orders on Tuesdays. The beans are ground and packaged the same day and delivered Wednesday morning. "When we open up the coffee bag, you can smell it through the back half of the restaurant," she said. "When we brew it, you can smell it out the front door."